Overall demand for import purchases and overseas localized procurement by China National Nuclear Corp is expected to top 12 billion U.S. dollars in the next five years, the company said during a news conference on Wednesday during the ongoing China International Import Expo in Shanghai. Major areas for seeking contracts include nuclear power and fuel－including bulk raw materials, machinery and engineering－it said at a news conference about the requirements for doing business internationally. The State-owned company will actively promote overseas projects using Hualong One technology, a domestically developed third-generation reactor design, said Yu Jianfeng, its chairman. CNNC will assist in the construction of industrial infrastructure in countries and regions participating in the Belt and Road Initiative, while coming up with more local jobs to improve the lives of residents, he said. The total amount of overseas localized procurement by the company is expected to exceed 3.6 billion U.S. dollars in the next five years, most of which will go to countries and regions in South Asia, the Middle East and South America. The first Hualong One reactor was erected by CNNC as part of Unit 2 of the nuclear power plant in Karachi, Pakistan. 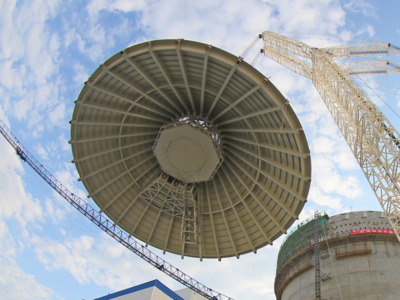 Construction of the reactor started in August 2015. Unit 3 started in 2016. The total installed capacity of CNNC's nuclear projects in Pakistan has so far reached 4.63 million kilowatts. More than 1.3 million kW are being generated currently. The projects have alleviated local power shortages and boosted the country's economic development, the company said. It has been stepping up cooperation overseas in recent years, with local partners in countries such as Pakistan, Argentina, Saudi Arabia and Ghana.